Well as some of you may or may not know, I had baby Thrace a little over a month ago (May 26, 2009). My stats . . . he is my 5th child, 4th son. It was my 5th 'planned' homebirth (first ended in transfer after 3 hrs of pushing due to excessive bleeding on my part and decels on baby's part) but 4th baby to be born at home. 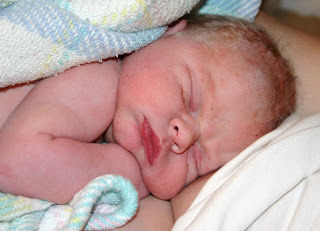 He was a land baby like my first (also weighed the same as my first 8.4) after 3 waterbirths. Not sure what I was thinking when I decided not to 'plan' a waterbirth this time, obviously it was pregnancy brain getting to me, LOL!!! I explain it all in the birth story though. It was my 3rd unassisted birth. It wasn't an easy birth. So far each birth had gotten easier than the previous, but not this time. Though nothing can compare with my first birth (5 hr transition, 5 hrs pushing, it was durn hard!!!) Labor was long 24 hrs, and I pushed for 2 1/2. So much for the thought that the more kids you have the easier it is for them to 'come out' LOL!!! It was my 3rd birth where I had really weird like spaced out contractions. Lets just say that for the last 3 births, were I in the hospital, my labor would have no doubt been termed 'dysfunctional' and I would have been bombarded with all sorts of interventions. Actually come to think of it, my 2nd baby was the only one where things went pretty 'textbook' during the labor. My first would have most likely been a c/s. I have been so amazingly blessed by God to have 5 beautiful healthy kids an 5 natural births where I was able to listen to my body and avoid interventions, despite my labors being so 'unusual'. Some of you know I use the name Entergently on lots of forums, and for my other website. The name describes how I strive to live and 'be' with my family. And it starts with a gentle entrance into the world . . . it is so important to me that my kids start out life this way!! And I hope to carry it on throughout their lives as they learn and grow. The birth story is long (and very detailed and somewhat and bloody . . . just a heads up) ;0) so grab some popcorn and a comfy chair. I have pictures and video stills from the birth up too. 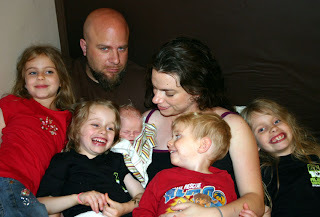 To read it go to www.entergently.homestead.com/Thrace.html and click on the link for his unassisted birth story. I read your birth story a couple of weeks ago. I enjoyed every (harrowing, intense and suspenseful) moment of it! I had the benefit, though, of a) not being in pain; and b) already knowing the outcome...LOL! So glad to see a Kozy Blog! As you know we've been fans since, what January 2004?! Still loving the Kozy with weeist one who's now 2 1/2. I am going to try to keep on top of this blog and keep y'all updated on what is going on with all of us. Kelley, I'm so glad you're blogging! I got my cozy from you in 2005 and discovered your birth stories then. You write about it so beautifully! Really touching, and it's like being there. I'm so glad you have a new blessing! Congrats!